Hopefully this page will help reduce our families’ concerns for our safety. Dane and JoAnn, please don’t worry too much, all will be well. When we’re on the open ocean we don’t go out into the cockpit without our PFDs (Personal Flotation Device) being tethered to the boat with safety harnesses. 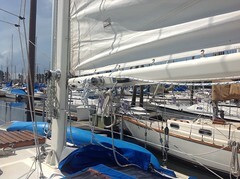 We have heavy duty jack lines (2″ double braided mesh line) that goes around the entire boat deck. 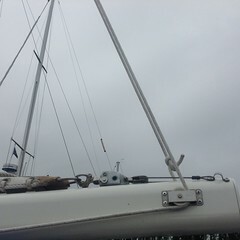 This allows us to transfer our tether and harness and keep us attached to the boat as we walk around on the foredeck. The ocean is large, we’re a small boat but we know how to read the charts, we really don’t need an engine except to get into a marina, it would be nice. 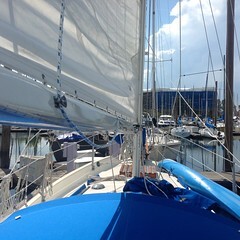 We have extra sails, lots of food and water. Duct tape to silence the whiner, and rope to tie them up. This is the Emergency Locator Beacon. If we have a life threatening situation, the EPRIB will be set off and the appropriate search and rescue authorities will be notified and in turn, our designated family members will be contacted. McMurdo SMARTFIND Plus is the new EPIRB technology. This compact unit incorporates a high accuracy GPS for enhanced position location. The EPRIB sends out our position for 72 hours. In addition, we have an ACR Personal Locator Beacon. It sends out our position for 24 hours. Both units will be with us. 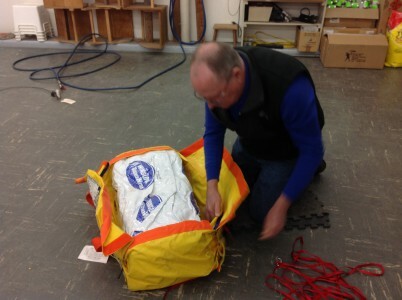 The yellow and orange nylon valise protects and encases the vacuum packed raft . All we have to do is pull the attached lanyard and the CO2 bottle will do the rest blowing open the sealed pack. This is the CO2 cartridge and raft inside, the red lanyard is attached to the cylinder’s release valve. A sharp pull on the lanyard will start the inflation. The raft begins to inflate, we just have to wait for about 30 seconds to be fully inflated before we get into the water. 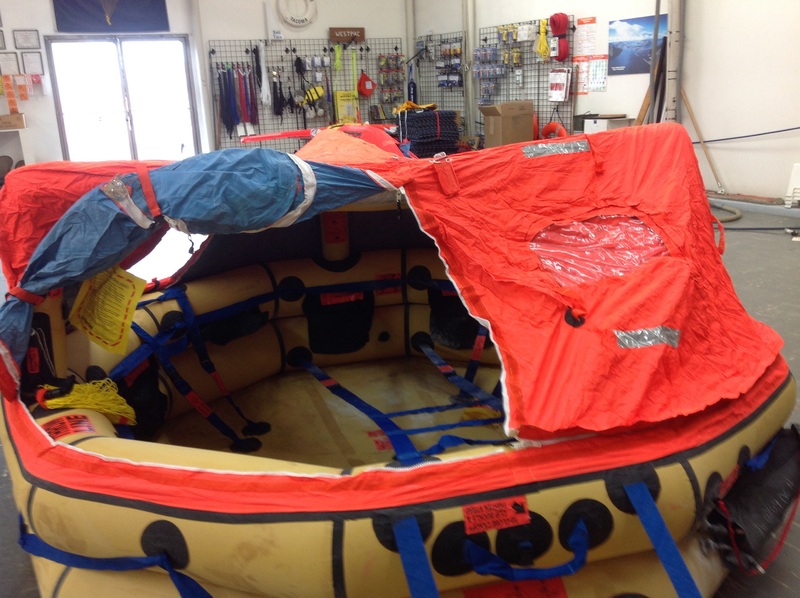 The interior of the raft is blue. It’s suppose to help calm us down. No shouting or blaming allowed. The raft may be inflated upside down, but no worries, the counter balance of a person stepping up on the boarding ramp and holding onto the straps will help right it. The weight of the CO2 cartridge also helps with righting the raft. This the in the bottom of the raft with the webbing attached to help right the raft. 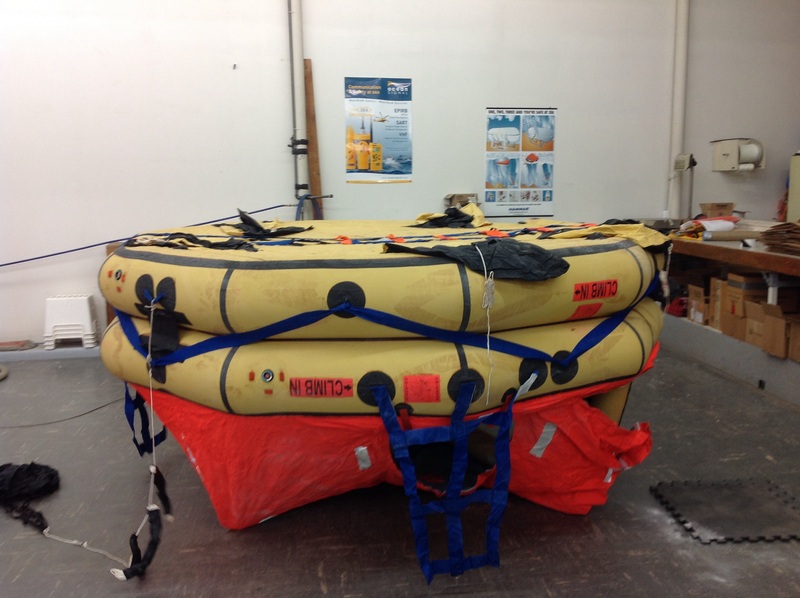 The black “bags” are actually ballast bags that help stabilize the raft when right side up. Note: that is not duct tape on the bottom of the raft. 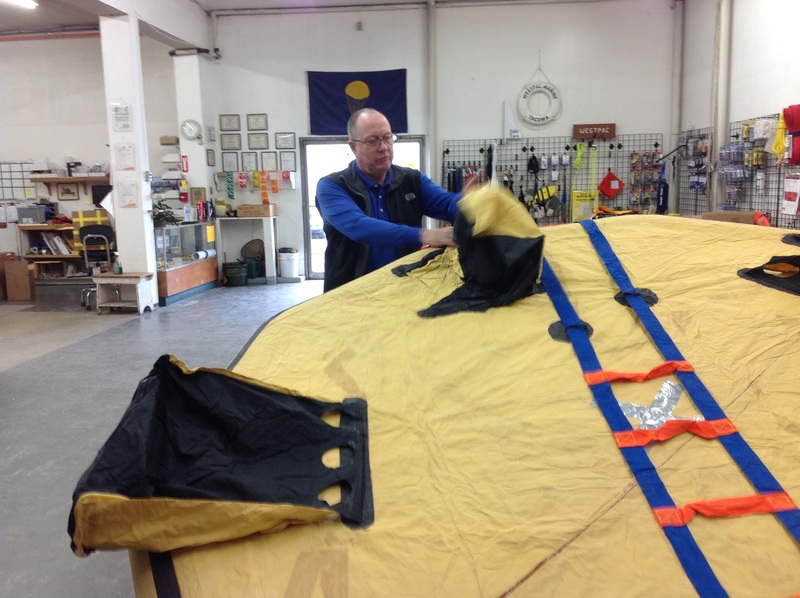 The raft has tents and full zippers to keep us dry and warm, keeping the water out. 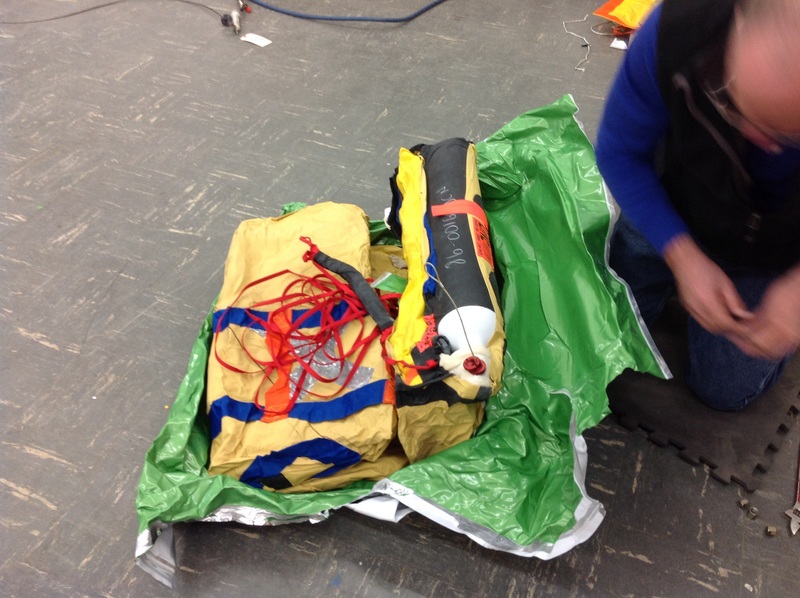 The raft is about 8 feet in diameter, 2 feet deep with storage packs, a collapsible bucket for baling, sponges, several small diameter ropes each about 50′ long. 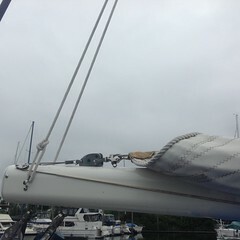 There is also a drogue chute. This chute trails behind the raft to help keep it surfing down waves, stabilizing the raft. There are strips of retro reflective tape glued to the raft. The tape returns search lights back to it’s source rather than bouncing off into another direction, making it easier to spot the raft in the dark. We have dye markers that leave yellow dye in the water to help the rescue team see us. 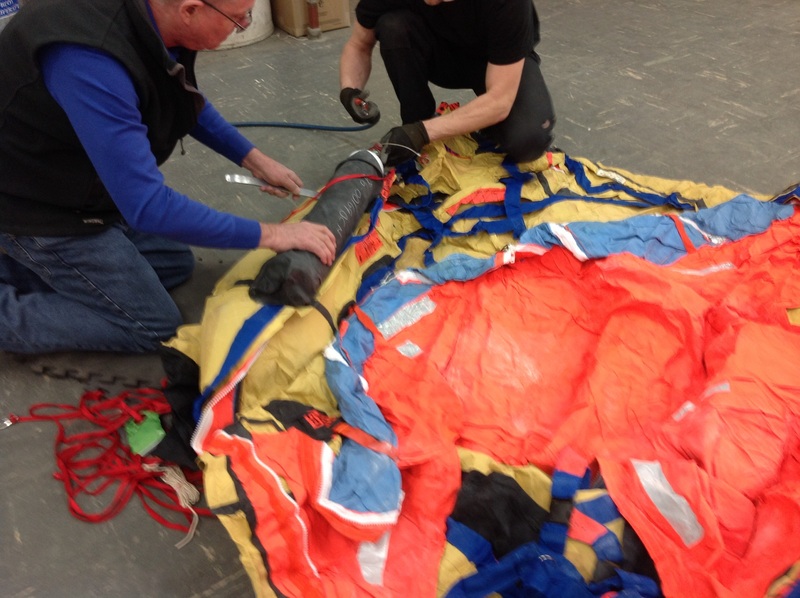 Flares that lasts 60 seconds, a parachute flare that can be launched 1,000 feet. Important note: don’t aim the flares at the helicopter or they will be busy rescuing themselves first and we’ll be second. A beacon lite is mounted on the top side. Lights, batteries, first aid kit, space blanket, fishing pole amongst other essentials are all packaged inside the raft. 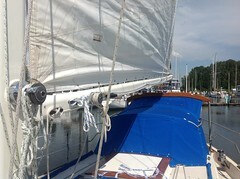 We also have a “ditch bag” that includes other personal and important boat items, water maker and food. 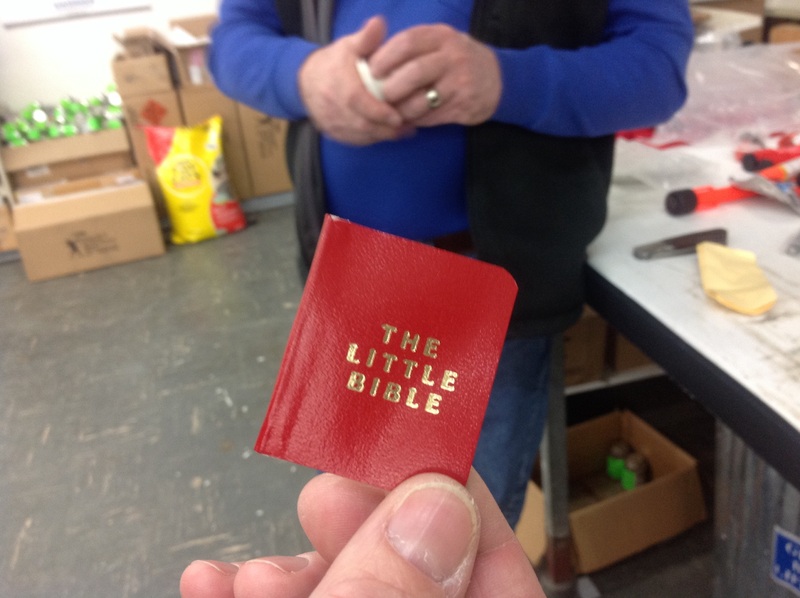 If all else fails, Winslow included a small bible in the survival pack. Seriously, it’s in there!